Winnowill’s cold, calculating elegance is backed by psychic powers of limitless depth and depravity. 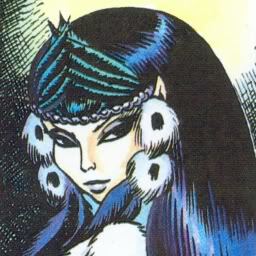 As the mistress of Blue Mountain–ruled by her manipulations and the quiet power of stagnation–Winnowill’s first principles are purity and perfection; to the wolf-blooded Wolfriders, she is the Black Snake. After they unraveled her web of power, they become her own bête noire. Wicked as she is, she was not always so. Countless centuries of boredom and disuse in the Gliders’ enclave caused her healing powers—and mind—to fester and turn in on themselves. To maintain the appearance of sanity, she arranged accidents to heal and tried in vain to convince her lovemate, Lord Voll, to find the lost Palace of the High Ones. Attempting to do so alone, she encountered a troll explorer, Smelt, whose crude needs gave Winnowill something new to feed on. Their offspring, the hybrid Two-Edge, she abused mercilessly. Winnowill is not above lying, seducing, kidnapping, or even murder to obtain her ends. At the height of her reign, Winnowill met Rayek, finding in him a kindred spirit – one who wanted much the same as she did. Rayek, though loving Winnowill, helped Cutter, Leetah and Suntop (later Sunstream), bring her down. 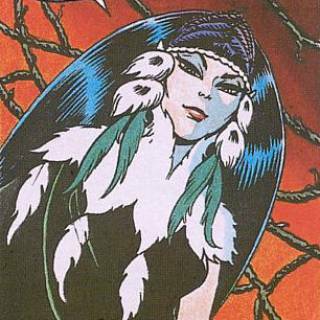 Her cocooned body was taken by Tyldak, who set out to punish his former Lord by isolating her on a remote island. Leetah attempted to heal Winnowill on several occasions only to realize the job could be completed only by Winnowill herself. Winnowill shaped-changed herself to be a water-breather. Sending to Rayek from the vast-deep, she encouraged him to whisk the Palace into the far-future. Over the coming centuries, Winnowill created countless mutant creatures to prey on the world’s native fauna, not least its humans. The Wolfriders’ Wild Hunt, under Ember’s command, eventually set out to track down and destroy these abominations. When the palace reappeared, Rayek and his daughter, Venka, immediately subdued Winnowill and held her captive there in a state of suspended animation. When the Palace emptied out to see Cutter settle his grudge with Rayek, she took her chance to strike. Venka interceded before she could steal the Palace, but the consequences were dire, causing the structure to shatter and fall in countless shards over human-occupied land. Ever the seductress, Winnowill shape-changed into human form and presented herself to the warlord, Grohmul Djun, as ‘Lady Venovel’. During her time with the Djun, she manipulated him into gathering the palace’s shards. The Wolfriders infiltrated his citadel and triggered a rebellion; the Djun, facing defeat, decapitated Winnowill, releasing her spirit to wreck havoc unencumbered by the limitations of embodiment. Before it could poison the shards with hatred, Rayek drew it inside himself and trapped it there. He now roams the World of Two Moons, an exile from his own race, keeping Abode safe from the spirit locked within.